Reap the fat-burning benefits of MCT Oil by adding it to hot or cold drinks, sauces, and dressings. Or, add it to your protein smoothies—MCT Oil goes great with MCT Lean Vegan Protein Blend. It’s the perfect pair! The world's only low-calorie fat. MCTs only contain 8.3 calories per gram compared to 9 calories for a normal gram of fat. What is MCT Lean MCT Oil? Is MCT Lean MCT Oil safe for everyone? Who will benefit from using MCT Lean MCT Oil? How is MCT Lean MCT Oil produced? I’m allergic to coconut and/or palm kernel. Can I use MCT Lean MCT Oil? Does it matter which source the MCTs are derived from? What is the difference between MCT Lean MCT Oil and coconut oil? How can I incorporate MCT Lean MCT Oil into my diet? What does MCT Lean MCT Oil taste like? How often should I take MCT Lean MCT Oil? 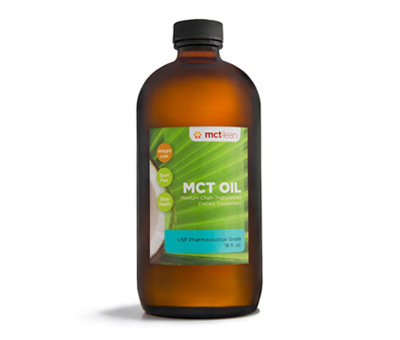 MCT Lean MCT Oil is composed of pure, plant-based caprylic (C8) and capric (C10) medium chain triglycerides (MCTs) that have been naturally extracted from coconut and/or palm kernel. MCT Lean MCT Oil can have a mild laxative effect and may cause mild nausea and gastric discomfort. These effects are typically noted by beginning users of MCT Oil and will usually subside with regular use. Avoid adverse side effects by starting with very small doses (approximately 1 teaspoon per day) and gradually increasing the dose as tolerated over time. Eventually, after regular use (approximately one week), tolerance will increase to 1-2 tablespoons per day. MCT Lean MCT Oil is generally safe for everyone. However, as is recommended for all supplements, you should consult your doctor or physician prior to use. Supplementing with MCT Lean MCT Oil could be potentially harmful to those with diabetes or other liver conditions. While anyone can experience the health benefits of MCT Lean MCT Oil, individuals on weight loss programs, athletes, bodybuilders, and those on low-carbohydrate diets or ketogenic diets favor MCT Lean MCT Oil as a dense source of easily absorbed, rapidly utilizable energy. MCT Lean MCT Oil is also an excellent energy source for individuals with fat malabsorption conditions and those requiring energy-dense diets. Those affected by Crohn’s disease, diverticulitis, irritable bowel syndrome, and candida may also benefit from MCT Lean MCT Oil. It is recommended that you consult your doctor or physician before use. However, MCT Lean MCT Oil is generally safe for people unable to tolerate coconut. Proteins within food cause allergens. Since MCT Lean MCT Oil is pure saturated fat from MCTs, those affected by coconut and/or palm kernel allergies should not be affected. No, it doesn’t matter whether the MCTs come from coconuts or palm kernel – MCTs are MCTs! But, since coconuts contain a greater percentage of MCTs than palm kernel, it’s easier to extract the MCTs from coconut. MCT Lean MCT Oil is composed of 100% medium-chain fatty acids (MCFAs) making it a purely saturated fat. Coconut oil is composed of 86% saturated fat, only ~63% coming from MCFAs. MCT Lean MCT Oil does not contain lauric acid, the primary medium-chain antimicrobial fatty acid found in coconut oil. Yet, the caprylic and capric fatty acids in MCT Lean MCT Oil still have the capability to suppress most germs, including the H. pylori and Chlamydia pneumoniae bacteria and CMV virus that are most notably linked to atherosclerosis. It’s so simple! You can add MCT Lean MCT Oil to any drink, smoothie, or shake and use it in place of highly processed and easily oxidized conventional vegetable oils in salad dressings, sauces, and low-heat cooking up to 320°F. MCT Lean MCT Oil is completely tasteless and odorless, making it even easier to get your daily dose of beneficial fatty acids. Once you are accustomed to taking MCT oil, the recommended daily amount to consume is 1-2 tablespoons everyday. Do not exceed 3 tablespoons per day.